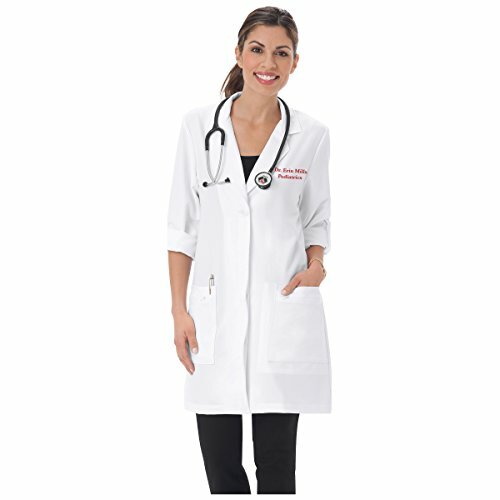 The Embroidered Pro Women's Mid Length Lab Coat has an even more polished look. The classic notched collar and multiple pockets for storage blend traditional and modern features. Missy fit, Notched neckline, Long sleeves with roll-tab button option, Center front covered button placket closure, Back princess seaming, Two front patch pockets with exterior zippered pockets, Single interior large iPad pocket, 75% polyester 21% rayon 4% spandex stretch tri-blend, Center back length: 33". Embroidery is available in a variety of colors and fonts. Order the embroidery online. Please refer to Meta's sizing chart and not Amazon's.